Second decan Aries born between March 31 and April 9. If a person is born between these days, ruling planet is Sun. This is a fortunate Decan, implying that the person would have both constructive and creative abilities. Aries person born under this Decan is ambitious, kind-hearted, idealistic and a born leader. They are also creative and hard working and high achievers, who would work relentlessly, until they achieve whatever they want. They tend to possess a good sense of humor, and have an uncanny ability to laugh on themselves. The negative traits of them are that they tend to be boastful braggers. They want to be the center of attraction for everything, they are attention seekers. People born under the second Decan are characterized by ambition, dynamism and creativity. They have the potential to achieve great success in any area. They just won’t stop until they achieve their goals. They are hard workers by nature and have the ability to get the job done and they are an inspiration to many. People admire their ability to overcome even the most difficult of challenges. They are very charismatic and attract attention and admiration. Because of this popularity this people never have a shortage of friends, contacts and acquaintances they can call on. Forever youthful, young at heart attitude to life they skip and jump through life. The main flaws are a tendency to brag and be boastful and smug. 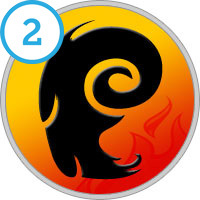 When the physical battle has been fought and won, Ram-man steps into the ranks of the emotionally polarized and joins those upon the second rung of the ladder. He is no longer totally immersed in the physical plane. Now he battles the forces of the astral or emotional plane to which he now naturally reacts. The Ram gains, through his evolving response apparatus, sentient consciousness in the world of forms. Thus the work and the labor of the soul expands to include the struggle with the fulfilment of desires, glamours and ambitions. This battle is stupendous—all that the Ram at this stage, can stand—but from the wider angle of the soul it is only one more rung of the ladder. Remember, it is the Sun which stimulates the sensitivity or awareness of moods, emotions, desires and aspirations which have their roots within the principle of self-awareness and self-consciousness. During the early phase of emotional development the mental nature is not functioning strongly and only very rarely does it come into any definite form of activity. At the early emotional stage the Aries man or woman is still only an unwitting sheep of the human family, and can be regimented and standardized with facility by orthodoxy and dogmatism of every type in any field, especially science, the military, religion and politics. On the recessive or negative side a list of the astral traits include unrealistic expectation, unresponsiveness, and insensitivity. The Arietian in this decan often feels rejected, stressed, isolated, alienated, misunderstood, dissatisfied and restricted. The Ram is uncontrollable, unaware, ungenerous, dictatorial, overconfident, blunt, self-destructive, insecure, forgetful, aloof, opinionated, rebellious, argumentative, one-track, naive, demanding, scornful, impulsive, angry, cold, cheap, cruel, hard, mean, violent, frenzied, crazy, ballistic, unstable, repetitive, indulgent, impatient, irritable, extreme, misleading, obsessive, grasping, possessive, resistant, anti-social, snobbish, classist, racist, repressed, judgmental, permissive, pugnacious and overbearing. The young Ram’s personal horizon is extremely limited. He is known for tacky style, questionable clothing, poor manners, bad taste, pet glamours, devious delusions and nervous habits which run in tiny grooves and small circles repetitively. Outside of his or her muddled myopic viewpoint and modest skills, there is little comprehension of life or circumstance. Struggling and grasping to make sense and appearing at times quite mad or insane, they are at best simply bewildered by other people’s ideas, outlooks or attitudes. As self-trust is not yet possible, so neither is trust in others. The advanced attributes and virtues of patience, tranquility, gentleness, and humility remain latent but as yet, uncultivated. The superimposition of the force of the Sun over the astral body fosters the sense of personal drama and helps to create the capacity to visualize oneself as the center of one’s environment. Like the Sun, the Arietian imagines himself to be at the center of his own tiny universe. "Around me the Heavens move and the stars in their course revolve" is the motto of this stage. (TWM, p.393) This consciousness, this sense of self, does help to determine their little destiny and relatively important or unimportant fate. The Sun, it should be realized, is responsible for fostering Ram-man’s ambition and his longing for superiority, authority, fame, wealth, comfort, leadership, influence and power in some field of human expression. Rams plan and struggle to make an individual impact on the world and to magnetically attract around themselves a group of people who admire them, thus making them feel influential and important. Personalities, keep in mind, experiment with the energy flowing through them and gather around themselves those people who vibrate to their note. Self-referencing, self-cherishing and self-grasping are the benchmark keynotes of the astral Aries. Do not forget that their entire motivating force is personal desire and energy. The process of decentralization is not desirable or possible at this stage of evolution. Compromise, tempering or restriction of their desires, fantasies or dreams is out of the question even if they are unusual, reckless, foolhardy or extreme. After many highs and lows, risings and settings, the man in Aries gains a sense of power, self-love, exalted ambition, a superiority complex and a determination to reach the top rung of a particular ladder. Both favor and disfavor will be known, but as applause is the breath of life for the Sun-inspired Arietian they try to do nothing that will endanger their popularity with their loved ones, fans or followers. The Ram gains a sense of personal responsibility; although this translates into a perception that the surrounding members of the human family are dependent upon them, and thus a sense of self-importance. As we would naturally expect in one ruled by the Sun, competition and emulation play a large part in Arietian progress, which of course have their unlovely aspects as well as their beneficent and stimulating effects upon the growth and development of personal character. Loyalty, follow-through and tenacity are not among the early virtues, so a constant desire for change of circumstance, surroundings and companionship are impossible to control or master. These urges continually cause sufficient difficulty in all manner of personal and family relations and quarrels. Commonplace, unrestrained emotional excitement, such as screaming, shouting and ordering people about — especially when stimulated by the urge for personal attention and recognition — spells personal, family, business and social trouble. Sibling rivalry is intense, often with the parents taking sides with tragic consequence. Some lives appear to be stunted, dwarfed, ruined or spoiled from the start. The energy enhancement of the Sun always leads to new endeavors and fresh activities. Because of this stimulation, developed types appear quite anomalistic. Becoming extraordinarily aggressive and self-willed the Ram acts with a singular dominant selfishness, exhibiting an extremely narrow range of sensitivity. For example, in matters of love the woman is exceedingly independent, active and unhampered by any social, moral, or family consideration beyond her own desires. The man, on the other hand, is passionate but selfish, rigid, narrow and conventional. In both cases, they typically resented early parental restraint or authority and are emotionally preoccupied with evidencing sensitivity to the steadily increasing intensity of their own vision, views and feelings. This type does, of course, possess a selfish instinctual love for those who are supportive or necessary for emotional stability and physical comfort, but they are in no way psychologically astute. Eventually the Ram learns that personal fame, stardom or victory depends on their adherence, and that only a sense of group loyalty gives any large enterprise its best chance of success. It is only at a mature stage of emotional growth that Aries will take the lion’s share of any danger involved, never shrinking, shirking or sparing themselves. It is the overlay of solar energy which also accounts for the sunshine-like optimism and the outgoing fun-loving expression of Aries. Inspired by the rays of the Sun, the Arietian subject is naturally bestowed with a positive outlook and a bright enthusiasm, but as yet has no means of gauging the opposing forces. Life is largely spent in various states of astral bewilderment, confusion and turmoil as they continually oscillate between simple awareness of physical plane life and the life of the senses. In time and through experience, the unfoldment and enhancement of the sensory apparatus affords the Ram an ever-increasing consciousness of the world of forms and the sentient ability to react to those forms with some small measure of embryonic wisdom and intelligence. Certainly Arietians are more immediately generous in showing spontaneous affection than any other type. The personal manner seems to be perpetually immature, loving, light-hearted, mischievous and given to practical jokes. A real knack for getting in and out of all kinds of adolescent foolishness is a fort, so life is composed of many narrow escapes, adventures and escapades. Impulsive tendencies lead to the trouble and sorrows that follow rash business partnerships, unions, engagements and imprudent marriages. Fortunately the astral disposition is specially endowed with a sense of fun along with a real gift for enjoying a situation, and may just succeed in making any relationship, marriage or business partnership a more or less happy contest or relatively enjoyable competitive duel. At least the foibles, follies and fancies are always highly colorful and full of dramatic flair. Also on the positive side, the list of hallmark emotional tendencies, traits and strengths are numerous. The Ram is gallant, dashing, daring, fearless, unshrinking, unsparing, good-natured, virile, fun-loving, lively, ambitious, consistent, courageous, self-expressive, enthusiastic, well-directed, dynamic, interesting, positive, open, affectionate, energetic, loyal, one-pointed, independent, sunny, self-sufficient, undaunted, responsible, self-reliant, realistic, idealistic, driving, visionary, tenacious, sincere, honest, magnetic, imaginative, progressive, diplomatic, socially aware, persuasive, dominant, humorous, generous, accepting, vigorous, fair and controlled. After many lifetimes in and out of every sign around the Great Wheel, the revelation of the Sun ultimately bestows full sensitivity and personal awareness of the hopes, wishes and dreams of the Lower Self. In time, some form of personal destiny, fame and fortune is sought by the Sun type and eventually attained. What is finally produced is a dominant selfish personality expression. At the apex of emotional development they express some obvious flair, style and taste. Working hard at playing a special part in their unique way, the mature Arietian becomes star-like, radiating a bright legacy. The Arietian in this decan governed by the Sun, like those born under the sign of Leo, make good artistic performers, singers, athletes or actors shining in stadiums, the arena, movies, theater and stage. A quick glance at famous movie stars of the 20th century shows this to be true. Consider for example Debbie Reynolds, Doris Day, Betty Davis, Spencer Tracy and Gregory Peck, all of whom were born under the central decan of Aries. Again the superimposition and dominance of the Sun-ruled emotional decan over the Mars-ruled physical decan bestows a tremendous brightness and positivism of a new type. A sense of power grows, they develop importance and influence, and a full-blown star is born.